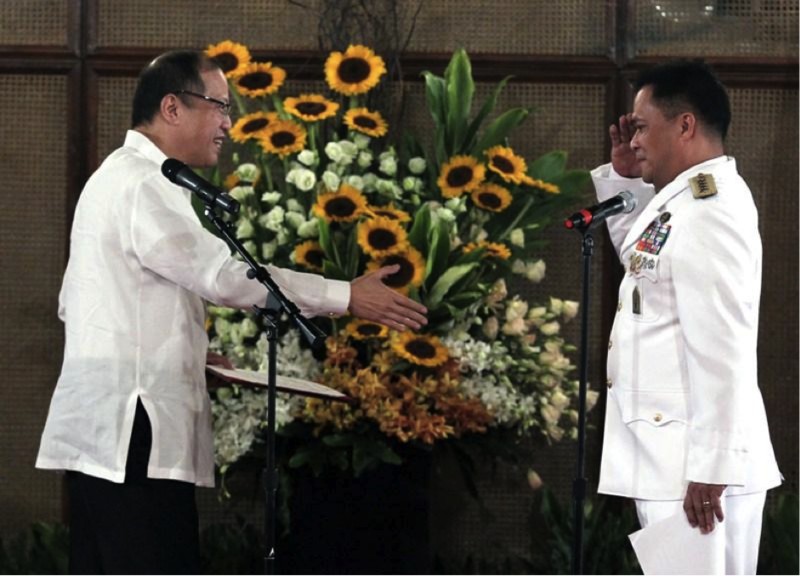 On July 10, 2015, President Benigno S. Aquino III presided over the change of command ceremony for the Chief of Staff of the Armed Forces of the Philippines. During the retirement ceremony for General Gregorio P. Catapang, he was conferred the Philippine Legion of Honor with the rank of Chief Commander. Lt. General Hernando Iriberri assumed command as the new Chief of Staff; he stands now as the highest military official of the country’s armed forces. The Chief of Staff of the Armed Forces of the Philippines (CSAFP) is the highest military officer in the Armed Forces. He commands all its elements—The Philippine Air Force, Army, and Navy. He directly answers to the President of the Philippines, who is Commander-in-Chief of the Armed Forces. The President of the Philippines exercises his authority over the Armed Forces of the Philippines (AFP) as Commander-in-Chief in view of the principle of the supremacy of civilian authority over the military, in order to strengthen this vital constitutional principle which is a fundamental requirement of democracy. This authority is enshrined in Article VII, Section 18 of the 1987 Constitution of the Philippines. For his part, the Secretary of National Defense (SND), as alter ego of the President, heads the Department of National Defense, and exercises “executive supervision” over the AFP, and supervises the National Defense program of the country; his role is primarily in the realm of policy-making. Because of this, the SND is not empowered to give operational commands to the armed forces, and is not part of the chain of command. This is because, as Commander-in-Chief, the President exercises his authority over the armed forces directly through the Chief of Staff of the AFP. As the highest military officer in the armed forces that answers solely to the President, the Chief of Staff is only second to the President in the chain of command. Thus, the Chief of Staff executes the commands directly given by the President to the Armed Forces in relation to military operations. He is responsible for planning, developing, and executing the national defense program prescribed by the Secretary of National Defense. The position of Chief of Staff traces its modern origins to the position of Chief of Staff of the Philippine Army, when the Philippines was again able to establish a standing army during the Commonwealth of the Philippines, which was the transitional ten-year preparatory period for independence. After the defeat of the First Republic, the United States had dissolved the the Philippine Army and relied on its own armed forces and a force of Filipinos under American command known as the Philippine Constabulary. Despite efforts to establish a Philippine National Guard as an embryo Philippine Army during World War I (a proposal rejected by the United States), the Philippines, as it embarked on the path to independence lacked a professional force to take on the responsibilities of national defense. The National Defense Act of 1935 established the Philippine Army (1935), and the Department of National Defense (1939) but until the end of World War II, all military functions, whether on land, sea, or air, were undertaken by the Philippine Army. In 1947, President Manuel Roxas, responding to the lessons of World War II and the independence of the country, established the Armed Forces of the Philippines with three main commands. However, since the 1960s, the Armed Forces of the Philippines has viewed its history as encompassing the army of the First Republic, and adjusted its rosters of Chiefs of Staff accordingly. In the outbreak of the Philippine Revolution against Spain on August 1896, a more systematic chain of command was organized within the Kataastaasang Kagalanggalangang Katipunan ng mga Anak ng Bayan (Katipunan). Andres Bonifacio, President of the Katipunan, appointed Teodoro Plata, his brother-in-law, as his secretary of war. However, at this point there was no position of Chief of Staff. 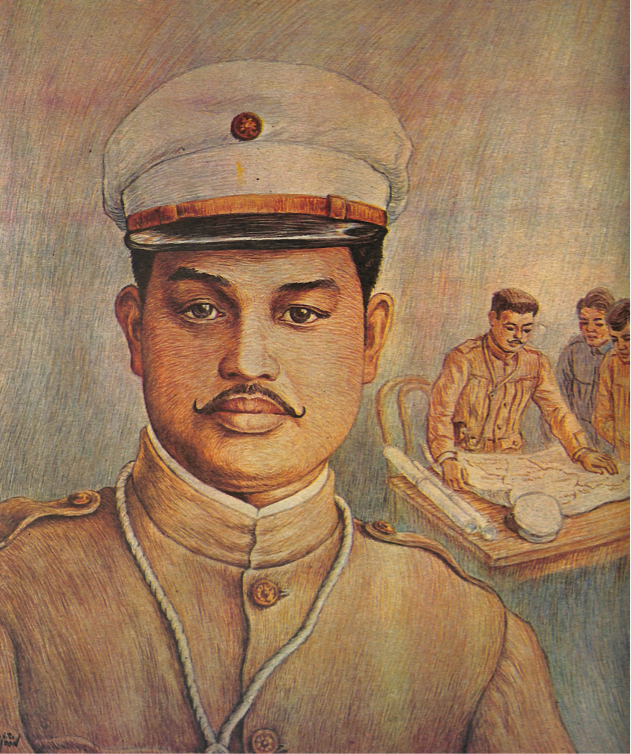 Bonifacio, as head of the Katipunan, was the commander-in-chief of its forces. When the Katipunan’ was replaced by a Revolutionary Government in the Tejeros Convention, the position of Captain-General, or commander-in-chief (following the title of the Spanish Governor-General as head of Spanish forces in the Philippines) was created.When Emilio Aguinaldo was elected in absentia to the presidency on March 22, 1897, Artemio Ricarte was elected Captain General. The first phase of the Revolution came to an end when a negotiated settlement was concluded between Filipino and Spanish forces on December 20, 1897, known as the Pact of Biak-na-Bato, which temporarily ceased hostilities on both sides, and led to the leaders of the revolution going into voluntary exile in Hong Kong. On May 19, 1898, Emilio Aguinaldo returned from exile to resume the revolution, inaugurating its Second Phase. After first proclaiming himself dictator and Captain General, he reorganized the government into a Revolutionary one on June 23, 1898. Baldomero Aguinaldo was appointed as Secretary of War and Public Works, and Antonio Luna—a known military strategist and Ilustrado, trained in Europe—was appointed as the Director of War, (the position now equivalent to Chief of Staff of the Armed Forces). At this point, the army was under the Department of War and Public Works, while the navy was under the Department of Foreign Affairs. Aguinaldo exercised complete control of the army, as Captain General, through his Secretary of War and Director of War. “General Antonio Luna” by EZ Izon. By permission of the family and heirs of the late artist. With the defeat of the Spanish forces in the country, on September 15, 1898, the Malolos Congress was convened, composed of civilian representatives from various regions all over the country. While the Congress ratified the Proclamation of Independence, it also attempted to assert civilian control over the Philippine government, which was then under executive control. In fulfillment of this, Aguinaldo appointed certain civilians into crucial defense command positions. He issued an order on September 26, 1898, reorganizing the departments, thereby integrating the Department of War into the Department of Foreign Affairs, with civilians in charge—Secretary of Foreign Affairs Cayetano Arellano, and Felipe Buencamino as Director of War. General Antonio Luna was made Chief of War Operations. The delineation of responsibilities between the Director of War and Chief of War Operations is unclear, but it can be assumed that the responsibilities held by the modern-day Chief of Staff was shared by the two positions–one civilian, and the other, military. This resulted in friction between civilian and military leaders over the policies and strategy to be pursued by government. When Aguinaldo’s cabinet was reorganized on January 1, 1899, under Apolinario Mabini as President of the Government Council (that is, Prime Minister), Baldomero Aguinaldo was reinstated as the Secretary of War and Navy. With the inauguration of the First Republic on January 23, 1899, Antonio Luna was appointed by President Aguinaldo as the Commanding General of the Ejercito Filipino (army of the Philippines) under the Department of War and Navy. These men held their posts amidst the growing tension between the Philippine government and the American military presence in Manila. Tensions had already escalated in the aftermath of the 1898 Treaty of Paris, concluded between Spain and the United States, without the representatives from the First Republic. With the outbreak of the Philippine-American War on February 4, 1899, Commanding General Luna led the Philippine army under heavy fire against the technologically advanced American forces (among other things, they utilized Gatling guns). However, upon the assassination of Antonio Luna on June 5, 1899, President Aguinaldo, as Commander-in-Chief, re-assumed direct command of all Filipino military forces. The Americans captured President Aguinaldo on March 23, 1901 at Palanan, Isabela, signalling the end of the First Republic and its chain of command but fierce resistance continued, led by General Miguel Malvar, and later by General Macario Sakay. However, even in the face of continuing resistance U.S. President Theodore Roosevelt declared the Philippines “pacified” on July 4, 1902. With the inauguration of the Commonwealth on November 15, 1935, the newly elected President Manuel L. Quezon issued Executive Order No. 2, s.1935, assuming command of military forces, thereby sending the signal that a Filipino chief executive had assumed the role of Commander-in-Chief, the power once held by Spanish and American governor-generals. The next day, President Quezon appointed Douglas MacArthur as military adviser to the Commonwealth, and established the Council of National Defense (Executive Order No. 3, s. 1935). The importance of national defense was emphasized by Quezon calling the National Assembly to a Special Session. In his first State of the Nation Address, Quezon pointed out that the special session was called for the sole purpose of deliberating upon, and passing, the National Defense Act (Commonwealth Act No. 1), authorizing a national mobilization in the face of impending threat or aggression. It established the Council of National Defense, with the President as the chairman. It also put emphasis on the supremacy of civil authority over military force—to strengthen constitutional principles of democracy to keep the armed forces subordinate to civilian authority. The Act viewed the formation of a citizen-army composed of reservists, with the core of Philippine land defense that it established resting on a small professional army of some 350 officers and 5,000 enlisted men, with a permanent army headquarters and staff. The Chief of Staff [of the Philippine Army] shall be directly subordinate to the President of the Philippines. Under the direction of the President of the Philippines, he shall cause to be made, by the Central General staff, the necessary plans for recruiting, organizing, supplying, equipping, mobilizing, training and demobilizing the Army in peace and in war and for the use of the military forces for national defense. He shall render annually to the President, for transmission to the National Assembly, a full report upon the condition of the Army of the Philippines including statements as to strength, cost, unexpended balances, requirements, and so on. A few weeks after the National Defense Act was enacted, President Quezon issued Executive Order No. 11 on January 10, 1936, designating Colonel Jose de los Reyes as the Acting Chief of Staff with the one-star rank of Brigadier General. 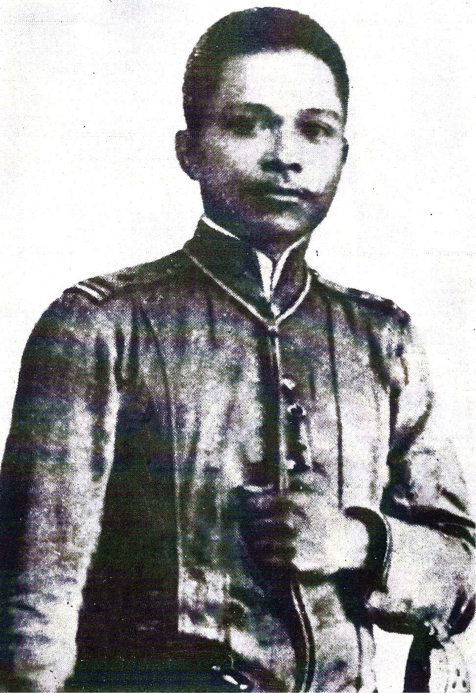 Colonel de los Reyes had retired from the Philippine Constabulary in 1930, and by the time of the law’s passage, he was the Chief of the Secret Service Division of the Bureau of Customs. Four months later, on May 4, President Quezon designated Colonel Paulino Santos as the permanent Chief of Staff with the two-star rank of Major General through Executive Order No. 26, s. 1936. Back in January, President Quezon had wanted to appoint Colonel Santos, then the Director of the Bureau of Prisons, as Assistant Chief of Staff, but decided against it because Colonel Santos was working on the transfer of Bilibid Prison from Manila to Muntinlupa. The National Defense Act of 1935 had a distinct problem: provisions concerning the rank and term of the Chief of Staff were absent, making the chain of command difficult to follow. To remedy this, the National Assembly approved Commonwealth Act No. 312, which amended the National Defense Act, on June 9, 1938. Section 1 of the act stipulated that the rank of Major General, the highest rank in the army at that time, could only be conferred upon the Chief of Staff, who would serve a term of three years. Section 2 authorized the President to appoint any officer of the Regular Force with the rank of Colonel or higher as the Chief of Staff from and after January 1, 1939. It also converted all current Major Generals besides the Chief of Staff to Brigadier Generals, after which their respective ranks were determined by the President. When Major General Santos’ term ended on December 31, 1938, President Quezon designated Major General Basilio J. Valdes as his replacement through Executive Order No. 179. Before the Commonwealth government withdrew to Corregidor, Valdes was also made a member of President Quezon’s War Cabinet on December 24, 1941, serving as Secretary of Defense, Public Works, Communications and Labor for the remainder of the Quezon administration. Retained in the Osmeña War Cabinet, Major General Valdes would remain the Chief of Staff until the end of World War II, returning with Field Marshal MacArthur and President Sergio Osmeña in their historic landing on Red Beach in Palo, Leyte on October 20, 1944. [The Chief of Staff] shall be responsible for the organization of these Military Police units and of other officers and enlisted men of the Army of the Philippines into a Military Police Command which shall be charged with the execution of all police duties and functions heretofore pertaining to the Philippine Constabulary and those specifically assigned to him by the President. Subject to the approval of the President, he may prescribe and issue regulations for the organization, conduct and administration of the Military Police Command. Valdes served as Chief of Staff until November 7, 1945. President Osmeña then designated Brigadier General Rafael Jalandoni as the first post-war Chief of Staff on December 18, 1945 through Executive Order No. 80, s. 1945. Jalandoni in turn served until December 20, 1948. The Third Philippine Republic was finally inaugurated on July 4, 1946, signalling the end of American sovereignty over the Philippines and the independence of the Philippines. Thus, this brought into the fore the question of rebuilding the country’s capacity for national defense, to safeguard the sovereignty of the newly independent nation. The Chief of Staff remained an important post in the Armed Forces in the face of possible threat or aggression from within and without. On March 10, 1947, a day before the plebiscite for the parity amendment of the 1935 constitution, a campaign rally was held at Plaza Miranda. As President Manuel Roxas was delivering his speech, a man lobbed a grenade on the stage towards the president. General Mariano Castañeda promptly reacted and kicked the grenade away then covered President Roxas with his body. The grenade exploded near the audience killing two people and wounding a dozen. The would-be assassin was later identified as Julio Guillen, a disgruntled barber living in Manila. 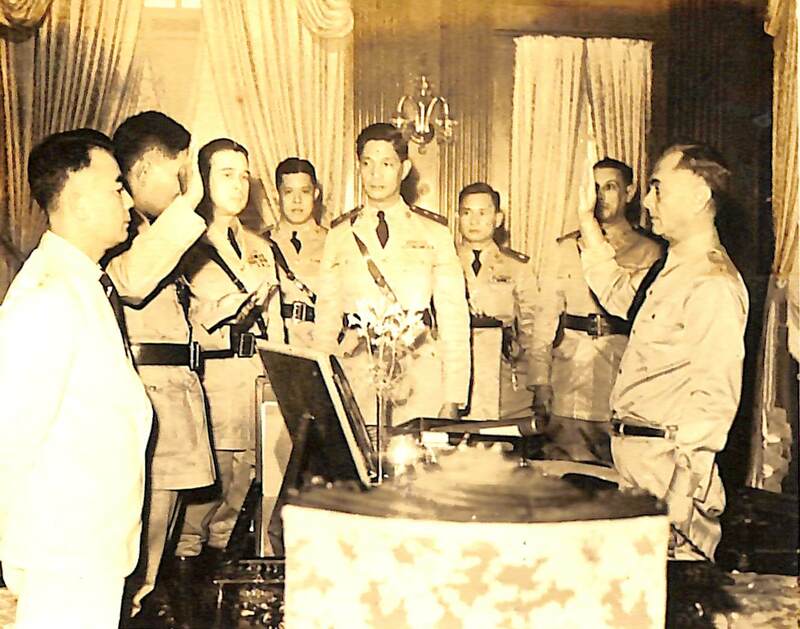 With the retirement of Gen. Jalandoni, General Castañeda was appointed Chief of Staff of the Armed Forces of the Philippines on December 21, 1948. The Chief of Staff [of the Armed Forces of the Philippines] executes the President’s command functions in relation to strategy, tactics, and operations. He is the immediate adviser of the Secretary of National Defense, and is responsible for the planning, development, and execution of the national defense program as prescribed by the Secretary of National Defense. He has command of all elements of the Armed Forces, and in the discharge of this responsibility, the Headquarters National Defense Forces shall function as a Field Headquarters in addition to its role as an administrative headquarters. He is authorized to prescribe the functions, duties, and powers of the various Staffs, Services, installations, and other units of the Armed Forces, and to issue from time to time such detailed instructions regarding personnel, funds, records, property, routing of correspondence, and such other matters as may be necessary to carry out the provisions of this Order. Orders, regulations, directives, and instructions are published in the name of the Chief of Staff, by order of the Secretary of National Defense. On March 30, 1950, Elpidio Quirino issued Executive Order No. 308, s. 1950 replacing the position of Chief of Staff with that of Commanding General of the Armed Forces of the Philippines. 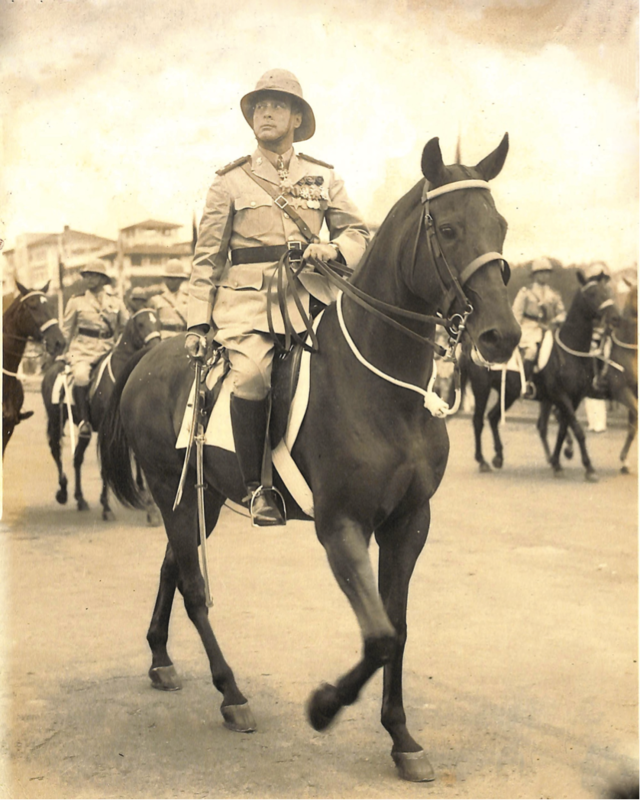 The Commanding General had a direct supervision of the five major commands under the Armed Forces of the Philippines: Philippine Constabulary, Philippine Ground Force, Philippine Naval Patrol, Philippine Air Force, and Philippine Service Command. However, the order may have caused confusion in the ranks, for in the same year, on December 23, 1950, Quirino signed Executive Order No. 389, s. 1950 to retract the changes made in the previous order. Section 14 of the same executive order detailed the limitation of the tour of duty of the Chief of Staff to three years (3 years) unless terminated or extended by the President. On July 23, 1954, Jesus Vargas became the first Chief of Staff to be temporarily conferred the three-star rank of Lieutenant General through Executive Order No. 49, s. 1954 during the administration of President Ramon Magsaysay. However, the temporary rank carried no increase in pay, and was only held by the Chief of Staff while he was in office, or at the pleasure of the President. 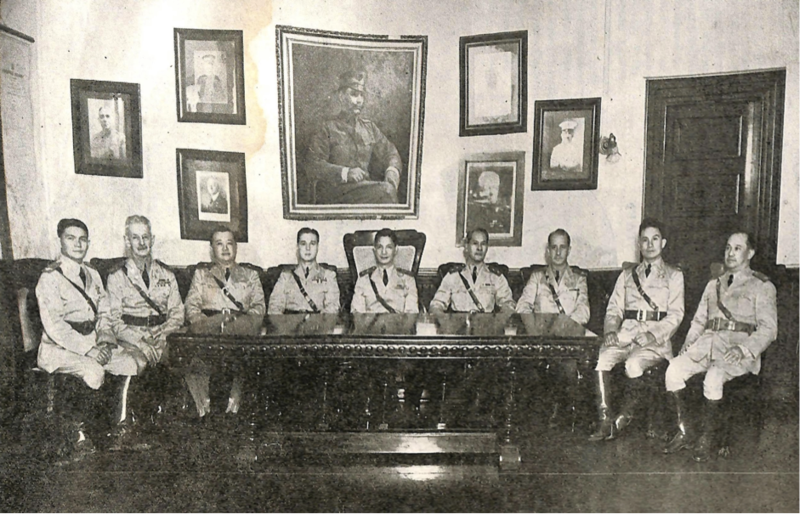 After Vargas, AFP Chiefs of Staff were Alfonso Arellano (Magsaysay); Manuel Cabal (Garcia); Pelagio Cruz (the first Chief of Staff to be appointed from the Philippine Air Force; Macapagal); Alfredo M. Santos (Macapagal); Rigoberto Atienza (Macapagal); Ernesto Mata (Marcos); Victor Osias (Marcos); Segundo Velasco (Marcos); Manuel Yan (Marcos); Romeo Espino (Marcos). This was a period of great challenges to the Armed Forces as the country grappled with the Huk Rebellion, requiring reforms in the armed forces. It was also a period when a new generation of officers who had only had junior rank during World War II, rose in seniority and the armed forces as a whole grappled with the pressures of political accommodations with congressional and executive leaders due to officers having to be confirmed by the Commission on Appointments in Congress. 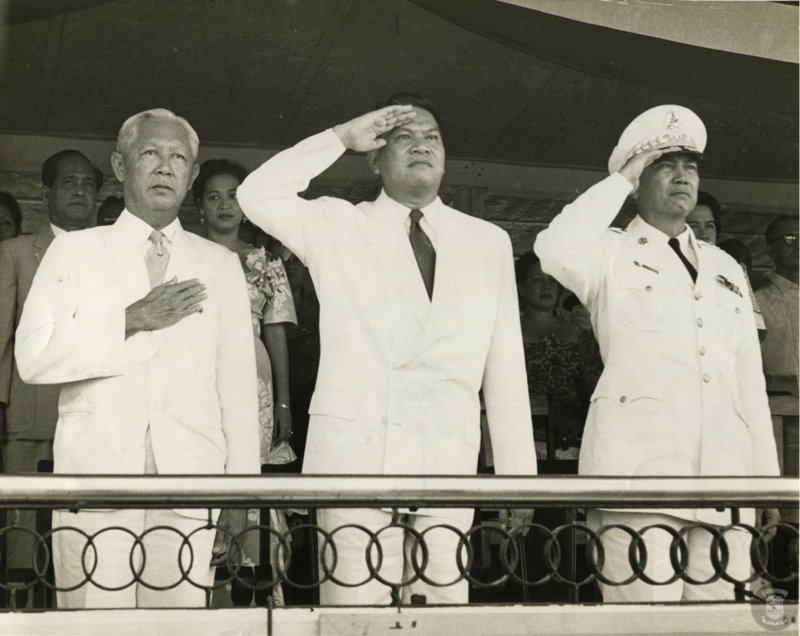 From LEFT to RIGHT: Secretary of National Defense Sotero B. Cabahug, President Ramon Magsaysay and Chief of Staff Jesus M. Vargas circa 1954-1956. On September 23, 1972, President Ferdinand E. Marcos placed the entire country under Martial Law, by virtue of Proclamation No. 1081. The same proclamation organized the Armed Forces into several task forces for the purpose of suppressing lawless violence in the country: Task Force Saranay, Task Force Palanan, Task Force Isarog, Task Force Pagkakaisa, and Task Force Lancaf. President Marcos then issued General Order No. 1, in his capacity as Commander-in-Chief, asserting that all powers had been transferred to the President who was to rule by decree. [I] do hereby order that henceforth the Chief of Staff, Armed Forces of the Philippines is empowered to create military tribunals to try and decide cases of military personnel and such other cases may be referred to them. The grades of command and staff structure of the Armed Forces of the Philippines was adjusted through Presidential Decree No. 360 on December 30, 1973. The restructure was made to maintain the pyramidal pattern in the Command and Staff structure as well as to strengthen the sensitive positions in the AFP. In November 8, 1979, President Marcos issued Presidential Decree No.1650 whereby constituting the compulsory retirement of military officers (including the Chief of Staff) and enlisted men upon reaching the age of 56. During most of the Martial Law period, the position of Chief of Staff was held by General Romeo Espino. He held the position from 1972 to 1981, becoming the longest serving Chief of Staff of the AFP. His successor was General Fabian Ver. 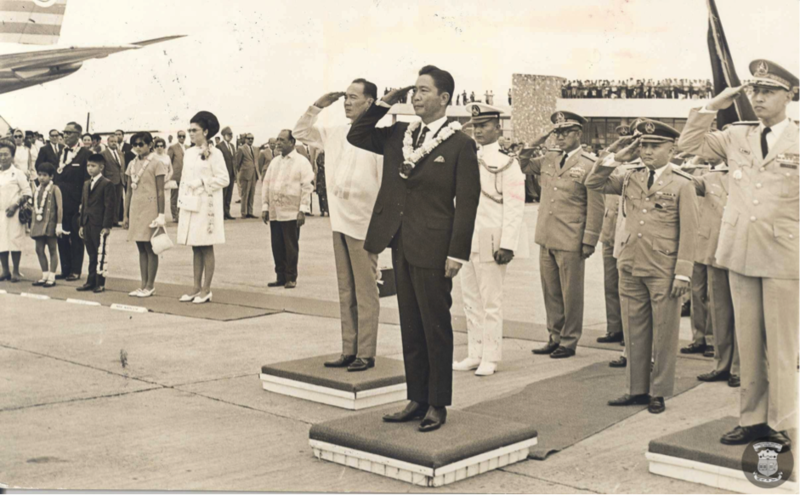 General Ver served as Chief of Staff until October 24, 1984 when the fact-finding committee known as the Agrava Board investigated his alleged connection to the assassination of Benigno “Ninoy” Aquino Jr. on August 21, 1983. General Ver was temporarily suspended during the investigation and was replaced by General Fidel V. Ramos as Chief of Staff of the AFP. In 1985 however, General Ver was acquitted of the charges against him and was reinstated on December 2, 1985. He served as President Marcos’ Chief of Staff until the EDSA People Power Revolution overthrew the Marcos Administration on February 25, 1986. On February 22, 1986, Defense Minister Enrile, together with AFP Vice Chief of Staff, Lt. Gen. Fidel V. Ramos, defected from the AFP. They withdrew their support from President Marcos, and asked him to step down from office. According to historian Patricio Abinales, this was due to the institutional breakdown of the AFP brought about by the military disenchantment towards Chief of Staff Fabian Ver and the patronage system that fostered factionalism within the AFP. Enrile and Ramos sought refuge in Camp Aguinaldo and Camp Crame respectively. It was during a press conference on the evening of the 22nd that Fidel V. Ramos first used the term “New Armed Forces of the Philippines” to differentiate themselves from those who continued to be loyal to President Marcos and General Ver. The defection led to an outpouring of civilian support leading up to the event known as the EDSA People Power Revolution. 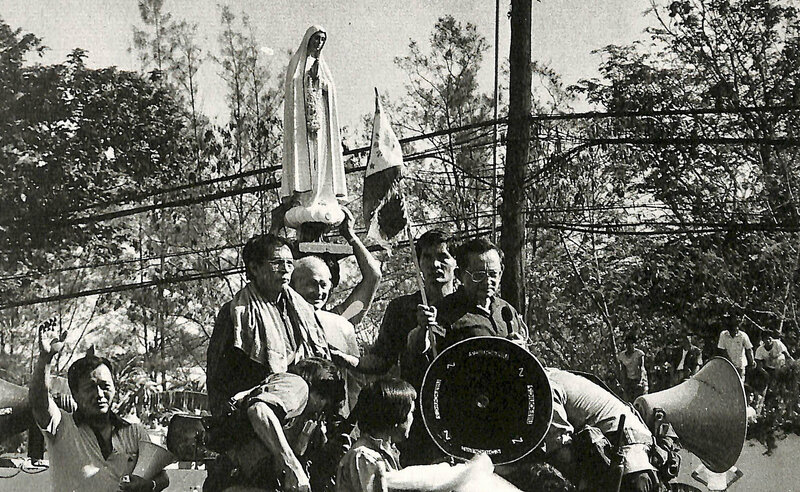 The success of EDSA made the peaceful transition of power possible. 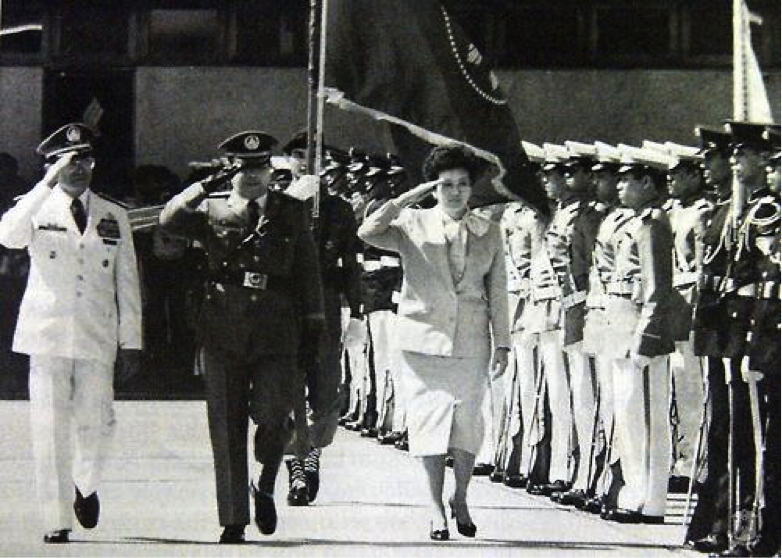 President Corazon C. Aquino was inaugurated president on February 25, 1986. It was during her inaugural ceremonies at Club Filipino, San Juan that President Aquino ratified the term “New Armed Forces of the Philippines” when she appointed Lt. Gen. Ramos as Chief of Staff of the New AFP . On March 25, 1986, President Aquino issued Proclamation No. 3, promulgating the Provisional Constitution of the Republic of the Philippines, known as the Freedom Constitution. It set parameters on an orderly transition to a government under a new constitution–a constitution different from the 1973 Constitution that gave President Marcos absolute political power. The Freedom Constitution invoked the mandate of the people vested on President Aquino, with the support of the “New Armed Forces of the Philippines” (NAFP). President Aquino viewed the Freedom Constitution as a temporary measure pending the drafting and approval of a new constitution. Promulgated on February 11, 1987, the 1987 Constitution restored civilian authority over the military by returning the AFP to its proper sphere of national defense. In line with its reform program, the NAFP launched a campaign to purge its ranks of factions. However, the campaign was unsuccessful; six coup attempts took place. The worst of the coups was the Christmas coup led by Colonel Gregorio Honasan on December 1, 1989, when rebels came close to capturing Malacañan Palace. In response to this coup, President Aquino created a fact-finding commission (known as the Davide Commission) to investigate through Administrative Order No. 146, s. 1989. During his term as President Aquino’s Chief of Staff, General Ramos defended the President from six coup attempts. In return, President Aquino appointed him as Defense Secretary when his term ended in January 1988; General Renato de Villa, General Ramos’ “carbon copy” protégé, became the new Chief of Staff. Fidel V. Ramos would later become President–the first president who served as Chief of Staff of the Armed Forces of the Philippines. 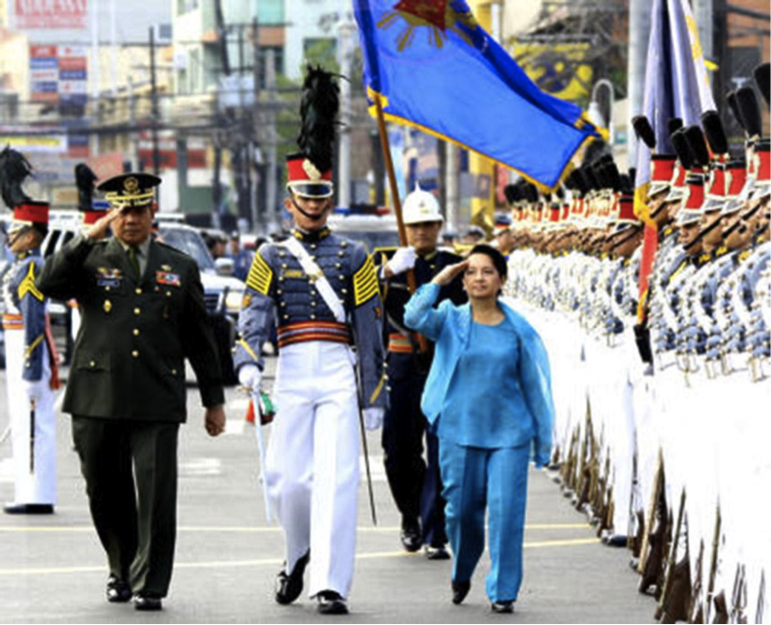 Although Article XVI of the 1987 Constitution Constitution states that the Chief of Staff can serve for a maximum of three years (although the President may extend the term during times of war or national emergency), most Chiefs of Staff since then have only served one-year terms or less, particularly during the administration of President Gloria Macapagal-Arroyo, who appointed eleven Chiefs of Staff during her ten-year presidency: Diomedio Villanueva (1 year, 2 months), Roy Cimatu (4 months), Benjamin Defensor Jr. (2 months), Dionisio Santiago (4 months), Narciso Abaya (1 year, 6 months), Efren Abu (10 months), Generoso Senga (11 months), Hermogenes Esperon (1 year, 10 months), Alexander Yano (1 year), Victor Ibrado (10 months), and Delfin Bangit (3 months). President Benigno S. Aquino III appointed Lieutenant General Nestor Ochoa as Acting Chief of Staff of AFP, succeeding General Delfin Bangit on July 22, 2010. He was then succeeded by Gen. Ricardo David Jr. (2010 – 2011). The position of Chief of Staff of AFP during the Aquino III Administration was then held by Gen. Eduardo Oban Jr. followed by Gen. Jessie Dellosa, Gen. Emmanuel Bautista and Gen. Gregorio Catapang. Officially, particularly since the 1960s when the list was expanded backwards, there have been forty-six Chiefs of Staff of the AFP who served Philippine presidents through the years. In the same manner that the foundation of the Philippine Army is now deemed to have been in 1897, so too does the official roster of chiefs of staff predate any of the official constitutional republics of the Philippines. However, in recognition of the foundation of the modern armed forces having been during the Commonwealth, AFP Day is observed on December 21, to commemorate the signing of Commonwealth Act No. 1 on December 21, 1935. 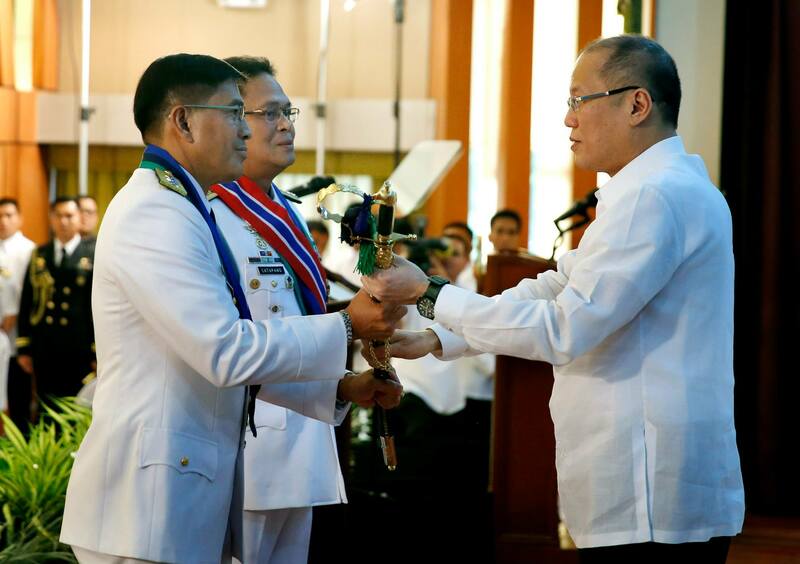 On July 10, 2015, President Benigno S. Aquino III appointed Lieutenant General Hernando Iriberri as the 47th Chief of Staff of the Armed Forces of the Philippines to replace the outgoing chief, General Gregorio Catapang in ceremonies in Camp Aguinaldo, Quezon City. Lieutenant General Glorioso Miranda became the acting AFP Chief of Staff when Lieutenant General Iriberri resigned on April 22, 2016. Final Report of the Fact-Finding Commission (Pursuant to R.A. No. 6832). Makati: Bookmark Inc., 1990. Guevara, Sulpicio, ed. The Laws of the First Philippine Republic (The Laws of Malolos), 1898-1899. Manila: National Historical Commission, 1972. Jessup, John. An Encyclopedic Dictionary of Conflict and Conflict Resolution, 1945-1996. Connecticut: Greenwood Press, 1998, link. Jose, Ricardo Trota. The Philippine Army, 1935-1942. Quezon City: Ateneo de Manila University Press, 1998. Kinzer, Stephen. Overthrow: America’s Century of Regime Change from Hawaii to Iraq. New York, NY: Times Books, 2006. Mabini, Apolinario. La Revolucion Filipina Volume 1. Manila: National Historical Commission of the Philippines, 2011. McCoy, Alfred W. Closer than Brothers: Manhood at the Philippine Military Academy. New Haven, CT: Yale University Press, 1999. Mable, Jing. “One Spirit, One Force: 100 Years of Revolutionary Tradition,” Philippine Free Press, June 12, 1998, p. 62. Mariano, Gen. Clemente P., “Toward a Credible, Relevant, Trusted AFP,” Philippine Free Press, June 12, 1998, p. 63-65. Morrow, Michael, and Moyer, Robin, ed. Bayan Ko! : Images of the Philippine Revolt. Hong Kong: Project 28 Days, Ltd., 1986. Philippine Daily Inquirer, From Ninoy to Noynoy: 25 Years of the Philippine Daily Inquirer. Makati City: Philippine Daily Inquirer, 2010. Richardson, Jim. The Light of Liberty: Documents and Studies on the Katipunan, 1892-1897. Quezon City: Ateneo de Manila University Press, 2013. Jim Richardson, The Light of Liberty: Documents and Studies on the Katipunan, 1892-1897, (Quezon City: Ateneo de Manila University Press, 2013), p. 417. Jim Richardson, The Light of Liberty: Documents and Studies on the Katipunan, 1892-1897, (Quezon City: Ateneo de Manila University Press, 2013), p. 330. Sulpicio Guevara, ed., The Laws of the First Philippine Republic (The Laws of Malolos), 1898-1899, (Manila: National Historical Commission, 1972), p. 35. Ricardo Trota Jose, The Philippine Army, 1935-1942 (Quezon City: Ateneo de Manila University Press, 1998), p. 10. ____, The Laws of the First Philippine Republic. p. 45-46. Apolinario Mabini, “Formation of the Mabini Cabinet” from La Revolucion Filipina Vol. 1 (Manila: National Historical Commission of the Philippines, 2011), p. 236-237. Stephen Kinzer, Overthrow: America’s Century of Regime Change from Hawaii to Iraq (New York, NY: Times Books, 2006), p. 55. Official Gazette of the Philippines, “Commonwealth Act No. 1,” accessed on July 7, 2015, http://www.officialgazette.gov.ph/1935/12/21/commonwealth-act-no-1/. Alfred W. McCoy, Closer than Brothers: Manhood at the Philippine Military Academy, (New Haven, CT: Yale University Press, 1999), p. 254. Michael Morrow and Robin Moyer, ed. Bayan Ko! : Images of the Philippine Revolt, (Hong Kong: Project 28 Days, Ltd., 1986), p.130. Philippine Daily Inquirer, From Ninoy to Noynoy: 25 Years of the Philippine Daily Inquirer, (Makati City: Philippine Daily Inquirer, 2010), p. 138. Final Report of the Fact-Finding Commission (Pursuant to R.A. No. 6832) (Makati: Bookmark Inc., 1990), p. 58. Final Report of the Fact-Finding Commission (Pursuant to R.A. No. 6832) (Makati: Bookmark Inc., 1990), p. 60. Alfred W. McCoy, Closer than Brothers: Manhood at the Philippine Military Academy (New Haven, CT: Yale University Press, 1999), p. 284. Alfred W. McCoy, Closer than Brothers: Manhood at the Philippine Military Academy (New Haven, CT: Yale University Press, 1999), p. 282-283.